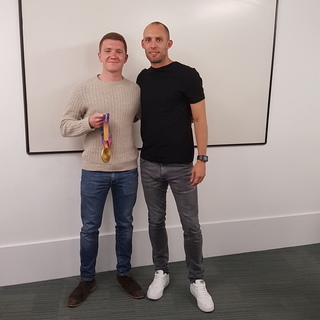 As part of the Jack Petchey Foundation scheme, Ross Franks - one of the latest recipients - asked if it was possible for Dai Greene to come and talk to club members. Dai came and spoke to club members for over an hour, bringing his Gold medals along with him which we all got to handle. Dai spoke about how he made the switch from football to athletics, about his love of competing and went into details of his training regime. The questions that were asked were varied and many - all answered in detail with anecdotes and Dai's personal experiences. The passion for his sport shone through and the message of hard work in training a trait throughout. At one point a golf ball was produced, shoes came off and a demonstration given on helping release a calf issue performed.